Buffalo Soldiers if a fun reading comprehension worksheet that can double up as a social studies worksheet too. This free and printable worksheet will engage 4th graders as it will introduce them to one of the important chapters of American history in a fun way. 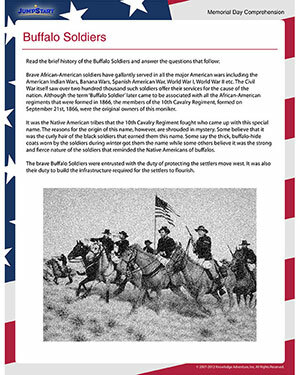 Help the budding historians find out about the Buffalo Soldiers with this worksheet. The exercise that follows will cement their learning. Check out our Memorial Day worksheets for more such fun exercises.